ChrissyAi: Enkelini Ruby Mine & Sapphire Mine swatches! 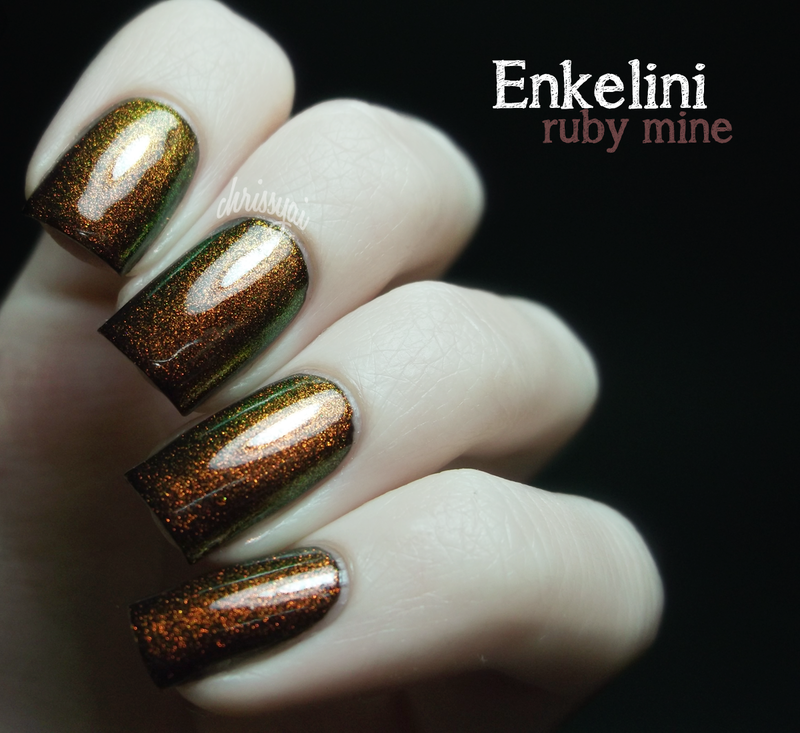 Enkelini Ruby Mine & Sapphire Mine swatches! This is two coats of Enkelini Sapphire Mine over China Glaze Liquid Leather with top coat. 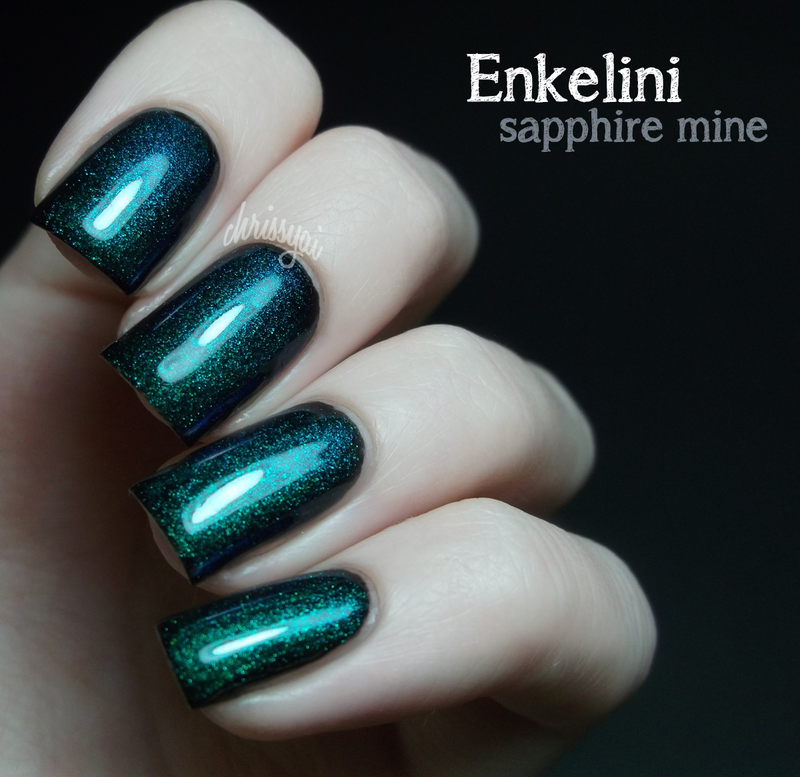 This top coat by Enkelini is a color shifting deep sapphire blue to to an emerald-like green. This has a 'clear' base with shimmers all throughout it. This polish is absolutely lovely and the color-shifting is effortless and breathtaking. This top coat was a little thicker than Ruby Mine which made it a tad harder to apply but it was still a breeze. The effect it gives on a color is truly amazing, it really makes the color beneath it its own. This is two coats of Enkelini Ruby Mine over China Glaze Liquid Leather with top coat. This top coat by Enkelini is a color shifting ruby red to a deep emerald green with an amber-to-green color in between. This top coat is a 'clear' base with shimmers all throughout it as well. This polish was very easy to apply and really took on a life of it's own over the black. I'm truly amazed by both of these polishes. 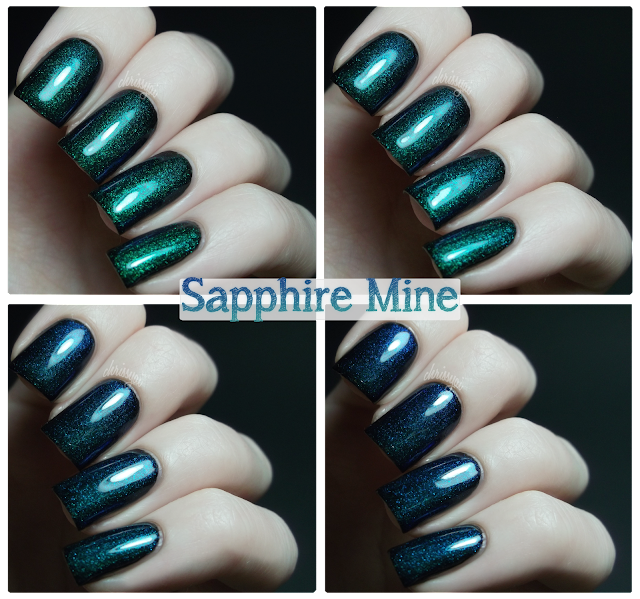 I can easily and honestly say that Sapphire Mine and Ruby Mine are one of the most, if not the most, unique and eye-catching polishes I own. They both look great in one coat, (However two coats was suggested, so that's what I tried) two did add more shimmer, but I definitely think one coat would've sufficed. You can find these polishes on Enkelini's Etsy Shop at the price of $4 for a miniature bottle and $8 for full size. Thanks so much, Pat! They're absolutely gorgeous. You've done an amazing job! Those are Awesome! Thank you for posting where I can get these! 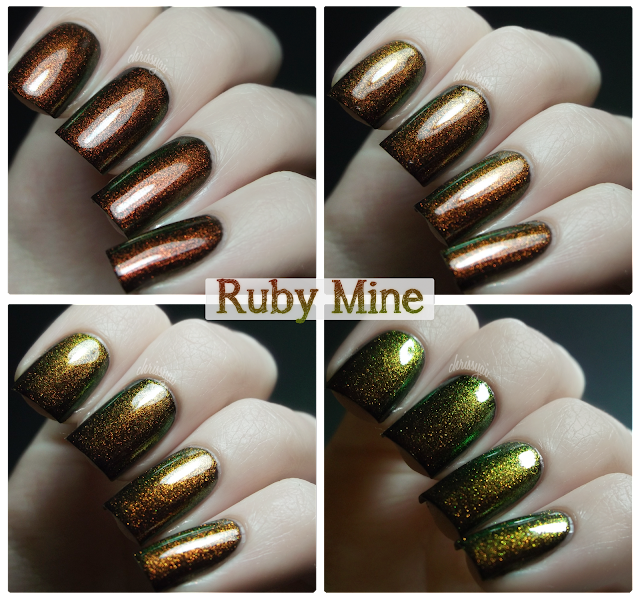 Wowza, now THESE are some serious colour shifting polishes.. so awesome! Wow.... that's so pretty.. ! Those are heaven i have those green ones but i haven't tried them yet. I'll probably try it! Again, you never fail to amaze me with your nail post. Im so jealous of you! I agree with Ashley. WOW! haha. They really transform that black! oh my goodness i love love love this!! sooooo pretty Christa! Oh gorgeous! It's like you are wearing real sapphires. They are both absolutely stunning!